Pass thehttp://4.bp.blogspot.com/-BQkG2GG8xyo/UBSxrx_OVzI/AAAAAAAACfU/oTJ-PC_BZ Slipped Stitch Over: a finished pair of socks! 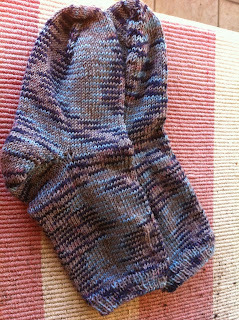 At long last I have finished the socks for my sister's birthday which was two days ago. Not only are they finished, but posted and received and she loved the denim colour. This was in the Yummy sock yarn bought in Newtown some years ago. I found it boring to knit as it pooled in many places. I tried to minimise the effects of the pooling by being careful just where I put the heel to split things a bit. 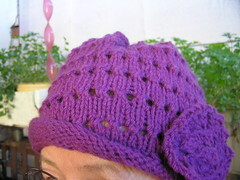 As you can see, these are hot off the needles with no blocking. I think she will make use of these where she is housesitting now. She is south of Canberra and the district is colder than Canberra. Tonight's minimum for Canberra is supposedly -2°C. 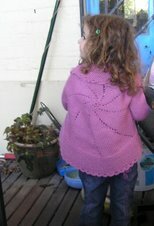 I made her some 8 ply socks some years ago which she wore inside until they dissolved into holes. She should be able to wear these with joggers to keep her feet warm. When she's finished at this house, she has another month in a similar area but slightly more inland, so they will probably be needed there too. Up here the maximum was over 30°C. The contrast is ridiculous for a car trip of just over three hours. We were sweltering on Friday and she had sleet blowing horizontally in the gale. We had the wind but had bushfires. I have started another pair of socks. The picture isn't bad for the poor light but the colour is really a very rich, vibrant ruby. It's called Tart by Madeleine Tosh. The socks are Mojo by Donyale. I've looked at this pattern many times over several years and finally decided the time had come to do it. I'll make a donation to the charity suggested by her providing clean water. The pattern is a mix of different patterns arranged within the sock stitches. After the toe cast on, the sock was turned inside out to give the purl finish. The other sock has stocking stitch on the toe. I am not fond of toe up socks but have made several pairs of socks that way. A long time ago. These have an afterthought heel. When I get that far, I'll consider if I diverge from the pattern to do my usual short row heel or if I'll be different for once and stick to the pattern. Do you ever wonder what to cook for dinner? I do. Often. I enjoy cooking, but just for myself it can become tedious. I was reading a group on ravelry and found a link to this recipe. Man pleasing chicken. I had all the ingredients, so decided to try it. There's no man here to please with my cooking but it certainly pleased me. It smelt delicious, the more so because I have recently started eating the 5:2 plan and yesterday was a day of low kilojoules, just 2000 kj over two meals. I was ready for something different tonight. It was very easy to prepare once I had thawed the chicken thighs. I discovered I did not have the full amount of Dijon mustard so topped it up with some grainy mustard. This was actually a good move. 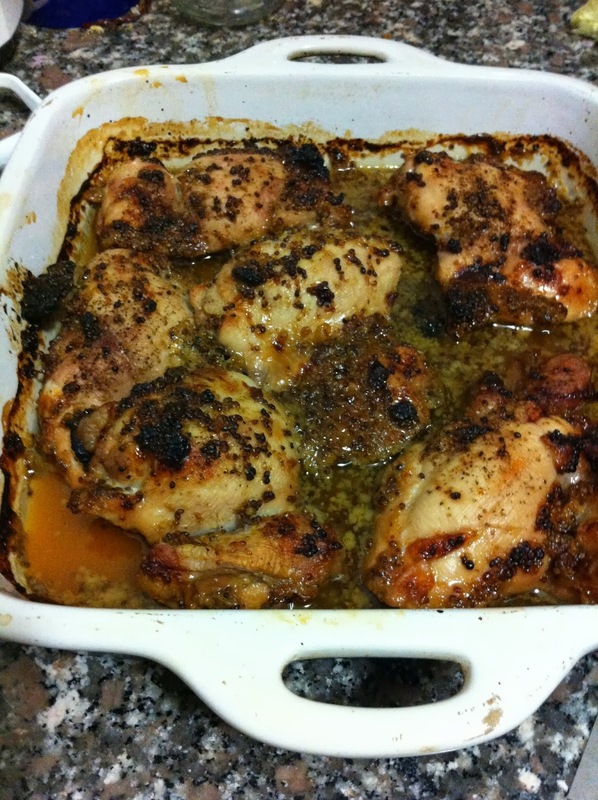 The grainy mustard made a pleasant crunchy topping on the chicken thigh. I forgot to put the fresh rosemary on the top to serve and I think a mix of rosemary and lemon zest would be good. The flavour was good and different. Although I knew what was in the recipe, no one flavour predominated. Best of all was that there were six thighs in the pack, so I have another two meals. I think it would also be good served cold as a lunch dish with salad. The chicken was moist and tender. A couple of minutes to stir the rice wine vinegar, maple syrup and mustard together and then into the oven. It could scarcely have been easier or quicker. I had a few mushrooms and some fresh asparagus in the fridge. 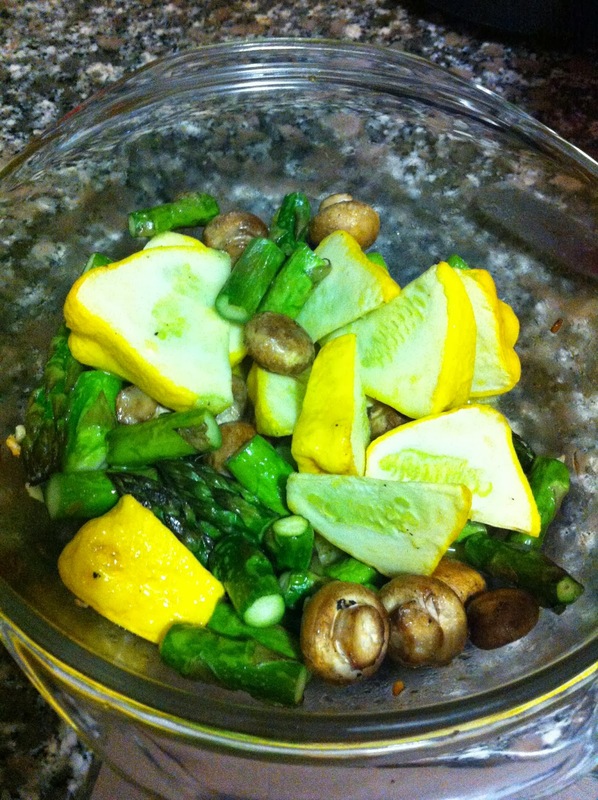 I put them into a pyrex dish along with a sliced button squash. That had some leftover garlic butter added and I put that in the oven with the chicken towards the end of the cooking time for the chicken. A good grind of fresh pepper and dinner was done and enjoyed. Even better is that there were four pieces of chicken leftover, another two meals all done and dusted. I'll keep one in the fridge and freeze the other. The chicken looks and sounds delicious. Funny weather we've been having, isn't it? Tomorrow is supposed to be much cooler than today, but Friday is supposed to be hot again! Weird!